I finally discovered the secret today to making great chocolate chip cookies: real butter. The last time I made cookies, I cut the recipe in half so I could have some chips left over for chocolate chip pancakes. I think I beat the dough too long and they ended up flatter than a pancake. Today Jackson had the day off school, so I thought I would make him a special treat. I pulled out the chocolate chips, which we both snacked on while stirring together the ingredients. This time, however, I decided to change up the ingredients I normally use. I was brought up on margarine. I rarely recall using real butter for anything, except when staying at my grandmother’s house. She used oleo, and all the recipes I got from her use that term for real butter. I’m not sure even where the word “oleo” comes from. (Since posting this, I’ve heard that oleo might actually be a term for margarine. Guess I need to Google it!) Grandma introduced me to the world of real butter, and there is nothing better than an ear of fresh sweet corn rolled in a cold stick of real butter with a dash of salt. Since making the change to staying at home and taking on the lion share (okay, pretty much all) meal preparation, I’ve been enjoying trying real butter in different dishes. The only one that wasn’t better with the real deal was boxed macaroni and cheese, and, well, imitation food tastes better with imitation condiments (though I’m not knocking a yummy box of Kraft mac ‘n cheese—sometimes it’s the only way I can get my children to eat). 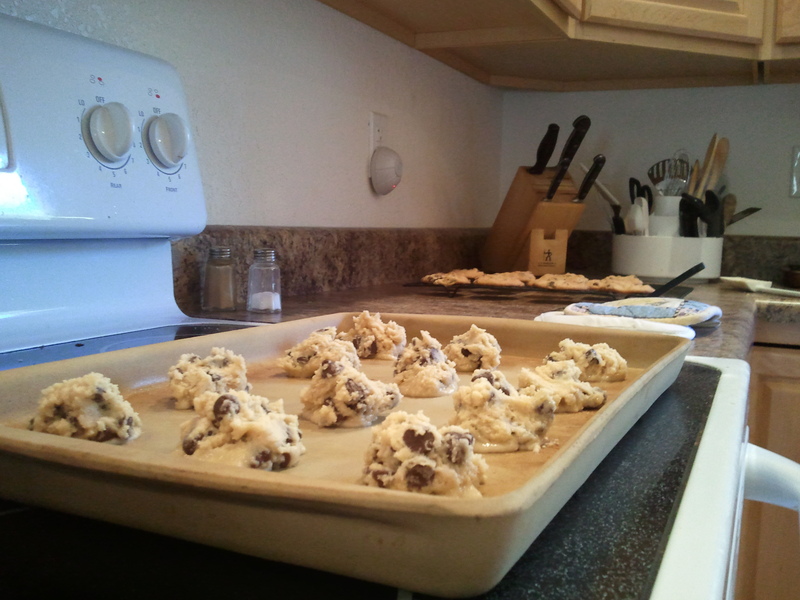 Today, I tried softened sweet butter folded into the cookie batter. The batter tasted much different with the changed ingredient, because I am so accustomed to the margarine. But, the finished product looked perfectly raised, shaped and Jackson would have eaten a dozen if I wouldn’t have cut him off. Apparently, real is better than fake. It took me this many years to realize that in baking because I didn’t know anything else. No one had shown me the difference. That’s the rub with Christianity, too. Most people have never experienced a real Christian, the kind who is wholeheartedly and unashamedly following Jesus, who are true examples of Christ’s love and forgiveness, who live life with such a peace and passion it causes others to shake their heads. For those of us who claim to be Christians, we are too often guilty of living as a margarine (marginal) Christian. We get used to living that way, along with so many others around us in the pews on Sunday morning. We pray when we need help, after we’ve discussed the matter with all of our close family and friends. We volunteer to assist at church, only because we were cornered and it’s only every once in awhile. We may wave at our neighbors as we pass by in our vehicles because we live in such a friendly neighborhood, but we’ve never had them over for dinner. We have the best of intentions to read our Bible at least a few times during the week, but can never get into a consistent routine because life is just too busy. We’re good people, and we do care about our community and our world. But, it’s been a very long time since we’ve actually shared with someone else how they can have a life-changing relationship with Jesus. We are safe Christians. We don’t take risks. We incorporate our faith into our life instead of letting our faith transform every aspect of who we are. Who we need to embrace is the real Jesus. Not the church-once-a-week Jesus, the looking-good-for-others Jesus or the getting-by-under-the-radar Jesus. I’ve had enough margarine cookies. I’ve tasted the real thing, and I don’t want to go back.